You know that potato chips and fries are packed with sodium, but what about brownies and cereal? Three health experts explain the salty consequences of our societal addiction to processed foods. Pass the salt, please. We've all said it before—probably more than we think. While the recommended daily consumption of sodium is 2,300 mg, studies have shown that Americans consume well more than that, with an average of about 3,600 mg per day—and especially Americans between ages 19 and 30 [1,2]. We consume so much salt that the American Medical Association has openly suggested we reduce salt consumption altogether . So, we get it: Sodium can be bad for us. But it's not all that bad. In fact, an amount is necessary for normal body function. So why should we care? Let's take a closer look. 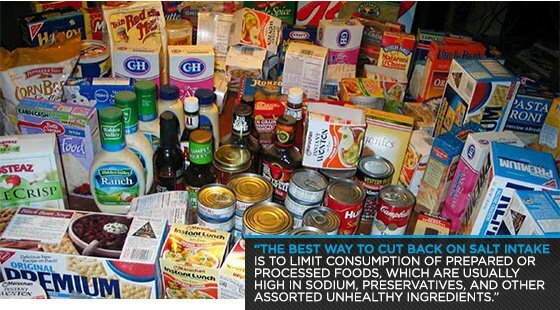 Approximately 80 percent of the sodium consumed by Americans comes from processed foods like cereals and baked goods. 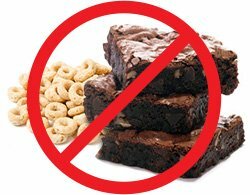 Bet you didn't know Cheerios and brownies are two salty culprits! . The other 11 percent comes from shaking salt at the table or throwing in a few pinches to the frying pan while trying to imitate the latest Top Chef stars [5,6]. But it's not just what we add ourselves that can be a problem. Processed foods are often high in salt, since it's used as a preservative to keep food fresh longer. So what is salt, exactly? Sodium is an element in table salt that is both necessary for certain body functions (more on that below), and that can also contribute to health issues like high blood pressure and heart disease when consumed in excess [7,8,9]. 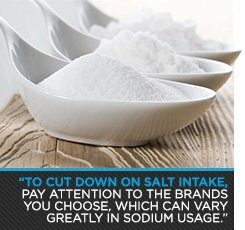 Why not just cut out salt completely? For one thing, some salt is essential. Important vitamins and minerals containing salt, like iodine and sodium chloride, can help maintain fluid balance, body temperature, and nerve and muscle function [10,11,12]. Salt is also necessary to maintain proper blood pH (the balance between acidity and basicity). And for the athletes among us, salt is essential in maintaining healthy blood pressure, so athletes should be wary of sodium deficiency from overhydrating before competitions [11,14,15]. Cutting back on salt too much may even increase cholesterol and triglyceride levels, which can contribute to heart disease . We know. It's tricky! To break it down a bit further, here's what three experts had to say. Kent Berridge, a professor of neuroscience and psychology at University of Michigan who researches the brain bases of emotion, motivation, and reward to determine what drives pleasure, liking, wanting, addiction, and the structure of natural behavior. Dr. Jeffrey Mechanick, an endocrinologist specializing in nutrition. He practices at Mt. Sinai Hospital in New York City and is the author of The Complete Guide to Lifelong Nutrition. Jason Edmonds, a biomedical researcher who works in the pharmaceutical industry and studies bacterial resistance to antibiotics and biological mechanisms strengthening autoimmune disease pathology. Edmonds is also a competitive Olympic weightlifter and one of Greatist's in-house experts. Q. 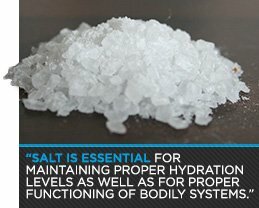 So let's start with a basic one: What does salt really do to the body, and why can it cause problems? Jeffrey Mechanick: Salt is an essential nutrient. It's a chemical the body needs in order to function. So why does it cause problems? As we enter into recent phenomena of processed foods which contain added salt solely for taste, we now overeat salt, more than our body can handle. As a result, blood pressure increases. But in general, across the board, we don't handle these high salt loads well. If you just associate salt consumption particularly among different ethnicities you see a higher rate of high blood pressure, which is a risk factor for cardiovascular disease and mortality. Jason Edmonds: Excessive salt intake is probably best known for high blood pressure and its related problems. One theory for how this happens is that the kidneys sense excessive salt in the body, signaling our hormones to pump out more water and fill up the empty space. This consequently increases blood volume. Some subsets of the population are at greater risk of suffering the ill effects of excessive sodium: African Americans, and people with high blood pressure, diabetes, and kidney disease. It's also worth noting that the association between salt and blood pressure in healthy adults with normal blood pressure is a matter of some contention. Apparently some studies have failed to uncover the correlation between high dietary sodium and increased risk of hypertension, especially in normal, healthy adults who don't fall into a high-risk category. So is salt a necessity for our diet? And why do we like it so much? Kent Berridge: Salt is a required part of a healthy diet. If the body loses salt, strong biological mechanisms kick in that give us an intense craving for it. Our normal liking for mild saltiness, and our [desire for salt], are both products of our evolution. In the past, salty food has represented an opportunity to stock up on salts for the body, so we like it. Sometimes our ancestors had to go for long periods without salt. That created emergency mechanisms that make finding and eating salt a higher priority in states of need. Salty pretzels are normally nice but seawater or a handful of salt is nasty. But in a "salt-need state," all of them start to taste nicer, because the body needs them. Jason Edmonds: Salt is essential for maintaining proper hydration levels as well as for proper functioning of bodily systems. We tend to crave savory foods and typically enjoy the taste of salt. Like sugars, salts were probably not nearly as abundant or easy to find during much of our evolutionary history. For this reason, we probably evolved to enjoy and crave the taste of sugar, salts, fat, etc., because when they were present we needed to ensure we got out fill. We've retained this craving for savory, sweet, and fatty foods, but in our modern culture—especially within industrialized nations—foods rich in salt, sugars, and dietary fats are abundant and readily available. As a result, we still crave them as if we're in a feast or famine state and so we end up consuming in excess of what we need to maintain proper physiological balance and health. What's the best way to cut back intake? Jeffrey Mechanick: The first recommendation is to read nutrition labels and be aware of the salt and sodium content in processed foods. Number two is to become familiarized with healthy eating. A diet that's high in fresh fruits and vegetables would be lower in sodium. This can help to decrease blood pressure and the risks associated with it. Jason Edmonds: It's important to moderate salt intake mostly to reduce the chance of developing hypertension, which significantly increases the chance of developing cardiovascular disease. In addition, salt has also been correlated with other problems such as stomach cancer and kidney disease. The best way to cut back on salt intake is to limit consumption of prepared or processed foods, which are usually high in sodium, preservatives, and other assorted unhealthy ingredients. Also resist the salt shaker. Many of our meals already contain sodium-rich sauces, gravy, and seasonings, so shaking salt onto those mashed potatoes along with a ladle full of gravy unnecessarily increases the sodium content. Choosing one or the other, or eliminating both and seasoning with crushed black pepper, are healthier alternatives for people who consume high levels of sodium in their diets. With this said, the scientific literature on the benefits of reducing salt intake are mixed. There's evidence showing that reducing sodium can lead to a modest but clinically relevant decrease in blood pressure, [and] that the risks from high salt intake are overblown and excessive reduction can also be harmful. Many of these studies conclude that reducing salt only slightly-to-moderately lowers blood pressure, and the reductions aren't significant enough to change the risk of developing cardiovascular disease. Some of these studies also say that salt reduction won't reduce risk of hypertension or cardiovascular disease in people with normal blood pressure. 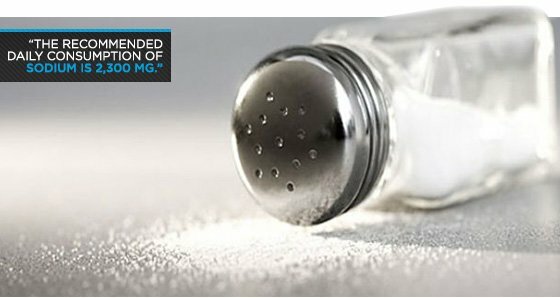 What are your thoughts on salt consumption research? Jason Edmonds: My opinion is that the average—even healthy—person should reduce their consumption of processed foods. These foods contribute to a large fraction of many people's daily salt consumption, but also typically contain other unhealthy ingredients such as unhealthy saturated and trans fats, high sugar, and preservatives. By limiting these foods, you'll also limit a whole host of other ingredients that, in excess, can increase the chances of developing hypertension and other health problems. To cut down on salt intake, pay attention to the brands you choose, which can vary greatly in sodium usage. Read nutrition labels and learn how to interpret sodium content—e.g., "unsalted" foods still contain natural sodium but are made without sodium. Avoid processed foods, cut back on those French fries and even cottage cheese, cook with less salt by trying different substitutes and remove that salt shaker from the table . Reducing the population burden of cardiovascular disease by reducing sodium intake: a report of the Council on Science and Public Health. Dickinson, B.D. and Hava, S. Council on Science and Public Health, American Medical Association, Chicago, Illinois. Archives of Internal Medicine, 2007 Jul 23;167(14):1460-8. Sodium Intake Estimates for 2003-2006 and Description of Dietary Sources.. Institute of Medicine (US) Committee on Strategies to Reduce Sodium Intake; Henney, J.E., Taylor, C.L., et al. Strategies to Reduce Sodium Intake in the United States. Washington (DC): National Academies Press (US); 2010. Salt intake, blood pressure and clinical outcomes. Cook, N.R. Division of Preventive Medicine, Department of Medicine, Brigham and Women's Hospital, Harvard Medical School, Boston, Massachusetts. Current Opinion in Nephrology and Hypertension, 2008 May;17(3):310-4. World Salt Awareness Week. He, F.J., Jenner K.H., Farrand C.E., et al. Journal of Clinical Hypertension (Greenwich). 2011 Mar;13(3):141-5. Salt intakes around the world: implications for public health. Brown, I.J., Tzoulaki, I., Candeias, V., et al. Department of Epidemiology and Public Health, Faculty of Medicine, Imperial College London, UK. International Journal of Epidemiology, 2009 Jun;38(3):791-813. Strategies to Reduce Dietary Sodium Intake. Cobb, L.K., Appel, L.J., and Anderson, C.A. Welch Center for Prevention, Epidemiology and Clinical Research, Baltimore, Maryland. Current Treatment Options in Cardiovascular Medicine, 2012 May. Determination of salt content in hot takeaway meals in the United Kingdom. Jaworowska, A., Blackham, T., Stevenson, L. et al. Faculty of Education, Community and Leisure, Centre for Tourism, Events & Food Studies, Liverpool John Moores University, I.M. Marsh Campus, Barkhill Road, L17 6BD Liverpool, United Kingdom. Appetite, 2012 Jul 4. Salt and high blood pressure. Mohan, S. and Campbell, N.R. Departments of Medicine and Community Health Sciences, University of Calgary, Calgary, Alberta, Canada. Clinical Science (London). 2009 Jun 2;117(1):1-11. Policy options to reduce population salt intake. Cappuccio, F.P., Capewell, S., Lincoln, P., et al. University of Warwick, Warwick Medical School, WHO Collaborating Centre for Nutrition, Coventry CV2 2DX, UK. British Medical Journal, 2011 Aug 11;343:d4995. A hot topic: Temperature sensitive sodium channelopathies. Egri, C. and Ruben, P.C. Department of Biomedical Physiology and Kinesiology; Simon Fraser University; Burnaby, BC Canada. Channels (Austin). 2012 Mar 1;6(2):75-85. Hydration, sweat and thermoregulatory responses to professional football training in the heat. Duffield, R., McCall, A., Coutts, A.J., et al. School of Human Movement Studies, Charles Sturt University, Bathurst, Australia. Journal of Sports Sciences, 2012;30(10):957-65. The role of sodium channels in chronic pain. Levinson, S.R., Luo, S. and Henry, M.A. Department of Physiology and Biophysics, University of Colorado School of Medicine, Aurora, Colorado 80045, USA. Muscle Nerve. 2012 Aug;46(2):155-65. Development of hydration strategies to optimize performance for athletes in high-intensity sports and in sports with repeated intense efforts. Maughan, R.J. and Shirreffs, S.M. School of Sport, Exercise and Health Sciences, Loughborough University, Loughborough, UK. Scandinavian Journal of Medicine & Science in Sports, 2010 Oct;20 Suppl 2:59-69. Fluid and electrolyte needs for training, competition, and recovery. Shirreffs, S.M. and Sawka, M.N. School of Sport, Exercise and Health Sciences, Loughborough University, Loughborough, UK. Journal of Sports Sciences, 2011;29 Suppl 1:S39-46. Effects of low sodium diet versus high sodium diet on blood pressure, renin, aldosterone, catecholamines, cholesterol, and triglyceride. Graudal, N.A., Hubeck-Graudal, T., and Jurgens, G. Department of Rheumatology TA4242/Internal Medicine, Copenhagen University Hospital, Rigshospitalet, Copenhagen, Denmark. , 2011 Nov 9;(11):CD004022. A comprehensive review on salt and health and current experience of worldwide salt reduction programmes. He, F.J. and MacGregor, G.A. Blood Pressure Unit, Cardiac and Vascular Sciences, St George's, University of London, London, UK. Journal of Human Hypertension, 2009 Jun;23(6):363-84.